Citation: C N Trueman "Gothic Church Architecture"
Gothic church architecture in Medieval England developed from Norman architecture. ‘Gothic architecture’ is the term used to describe building styles between 1200 to 1500. Such a large time span meant that a number of styles developed within Gothic architecture and it is common to divide these styles into three sections. The building between 1200 to 1300 is usually referred to as Early English; between 1300 to 1400, the style of building is referred to as Decorated and from 1400 to 1500, it is known as Perpendicular. It is common for major church buildings to show examples from all three of these periods. Gothic cathedrals are characterised by large towers and spires. 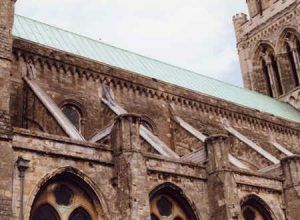 Whereas Norman architecture can be seen as being ‘dumpy’ due to their more limited knowledge of building, the Gothic era coincided with a greater knowledge of engineering and this is reflected in the church buildings completed during this era. Gothic churches and cathedrals were fundamentally different to Norman buildings. The increase in knowledge and skills acquired over the years, meant that stone was specifically cut so that it fitted next to other stone blocks with precision. Therefore, the large blocks of stone favoured by the Normans, were replaced by shaped stone. Another major change was that the hollow walls used by the Normans were not used by later architects. Walls and pillars were solid and this allowed them to cope with much greater weights. This simple fact allowed churches and especially cathedrals to be much larger than Norman ones. This, along with the money gathering ability of the Church, explains why the cathedrals and churches of the Gothic era were so much larger than previous ones. Another development that strengthened church buildings, was the use of pointed arches. This shape allowed a much greater weight to be carried when compared to a Norman rounded arch. Cathedral roofs were now much larger than Norman roofs. Therefore, they were a lot heavier. To ensure that the walls and pillars could take such a weight, the architects in this era developed what were known as buttresses. These were additions to the main part of the cathedral that allowed the extra weight to be transferred to additional parts of a cathedral than ran alongside the nave and then down into the foundations. The architects simply spread the weight to other points in the building. ‘Flying buttresses’ allowed the outward pressure of the massive roofs to be resisted. The concern about the weight of the roof at York Minster was such that the vaults in all but the smallest aisles were made of wood. This decreased the pressure on the pillars, foundations etc but led to future problems concerning fire and death watch beetles. York Minster does have flying buttresses but these were added in the Nineteenth Century. The ability to cope with greater weights also allowed Gothic architects to use larger windows. The Normans had been limited to using small slit windows. Now cathedrals and churches could have large stained glass windows. The Great East window at York Minster is the size of a tennis court, a size that would have been unthinkable for the Normans. These new huge buildings cost vast sums of money. Where did the church get this money from? Basically, the bulk of it came from the people of England. Peasants and town dwellers paid numerous taxes to the church – a tax at baptisms, marriages and deaths; tithes and for centuries people had to work for free on church land. The revenue gained from these assisted the building of cathedrals like those at Lincoln, York, Canterbury and Chichester.